Paleontologists at the University of Toronto (U of T) and the Royal Ontario Museum (ROM) in Toronto have entirely revisited a tiny yet exceptionally fierce ancient sea creature called Habelia optata that has confounded scientists since it was first discovered more than a century ago. Approximately 2 cm in length with a tail as long as the rest of its body, the long-extinct Habelia optata belongs to the group of invertebrate animals called arthropods, which also includes such familiar creatures as spiders, insects, lobsters and crabs. 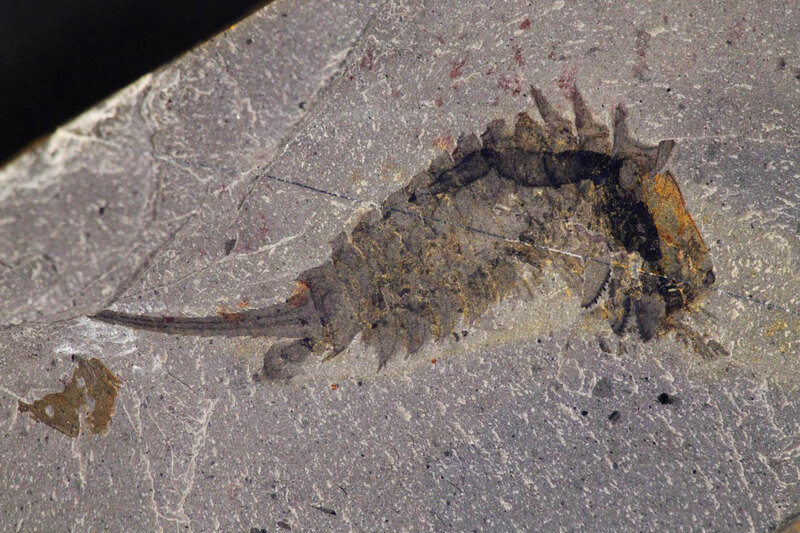 It lived during the middle Cambrian period approximately 508 million years ago and comes from the renowned Burgess Shale fossil deposit in British Columbia. 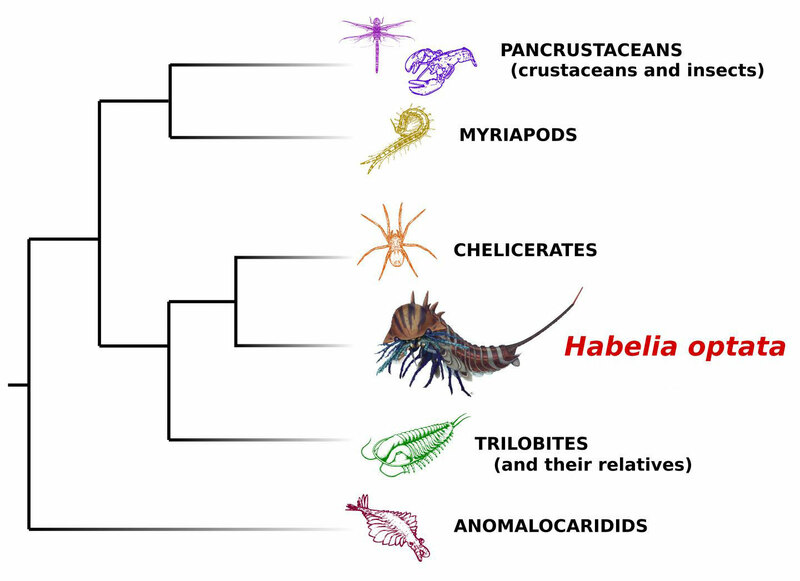 Habelia optata was part of the “Cambrian explosion,” a period of rapid evolutionary change when most major animal groups first emerged in the fossil record. Like all arthropods, Habelia optata features a segmented body with external skeleton and jointed limbs. What remained unclear for decades, however, was the main sub-group of arthropods to which Habelia belonged. Early studies had mentioned mandibulates — a hyperdiverse lineage whose members possess antennae and a pair of specialized appendages known as mandibles, usually used to grasp, squeeze and crush their food. 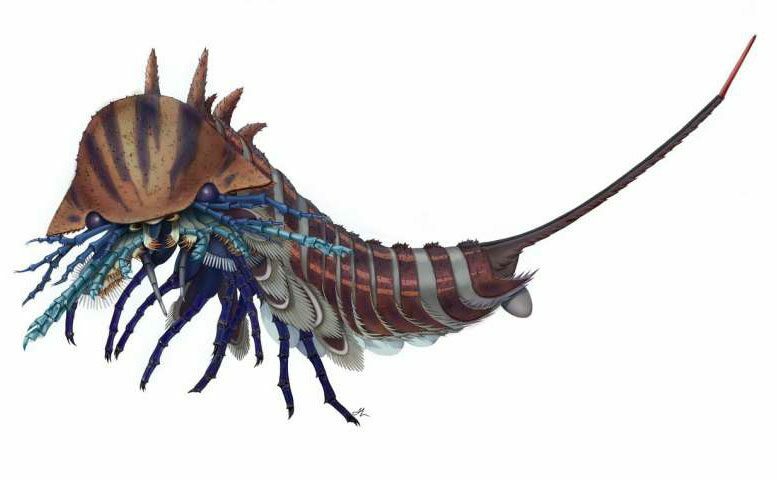 But Habelia was later left as one of the typically unresolved arthropods of the Burgess Shale. The surprising outcome of this study, despite the evolutionary relationship of Habelia with chelicerates, is that these unusual characteristics led instead the researchers to compare the head of Habelia with that of mandibulates from a functional perspective. Thus, the peculiar sensory branches may have been used in a similar fashion as mandibulates use antennae. Also, the overlapping plate-like appendages in the middle series of five are shown to open and close parallel to the underside of the head — much as they do in mandibulates, especially those that feed on animals with hardened carapaces. The researchers conclude from the outstanding head structure, as well as from well-developed walking legs, that Habelia optata and its relatives were active predators of the Cambrian sea floors, hunting for small shelly sea creatures, such as small trilobites–arthropods with hard, mineralized exoskeletons that were already very diverse and abundant during Cambrian times. “This builds onto the importance of carapaces and shells for evolutionary change during the Cambrian explosion, and expands our understanding of ecosystems at this time, showing another level of predator-prey relationship and its determining impact on the rise of arthropods as we know them today,” said Caron, who was Aria’s PhD supervisor when the bulk of this research was completed. 1 Comment on "Habelia Optata – A 508-Million-Year-Old Sea Creature"